One of the most popular candies for Halloween is candy eyeballs. Our oozing eye balls are perfect for kids of all ages. They are actually a marshmallow filled with jelly in an eyeball candy wrapper. One bite into this soft and chewy marshamallow and you get a jelly ooze. jelly fillings : Blood Berry - Strawberry, Gory Grape - Grape and Bruise Berry - Blueberry. 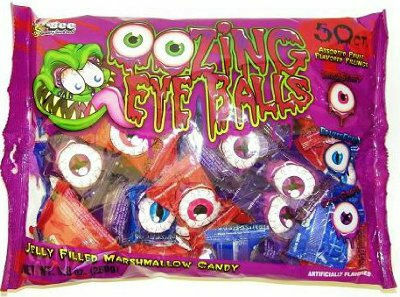 If you are looking for something a little bit different for your Halloween Candy this year oozing eyeballs might be just what you are looking for.